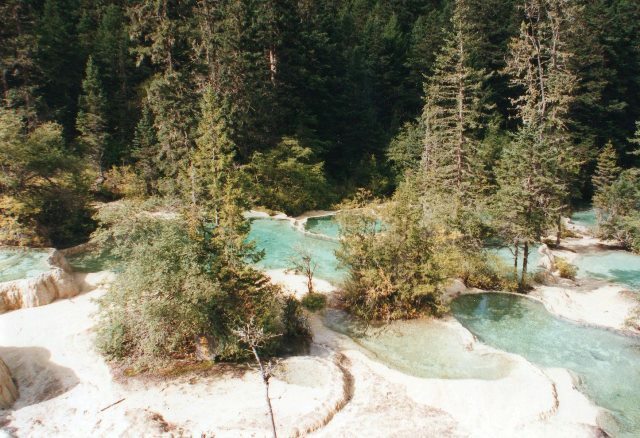 Deep in the mountains of the Tibetan fringe lies the weird and wonderful Jiuzhaigou World Heritage Site: deep valleys of bright mineral lakes and weird geology, set in unspoilt mixed forest beneath high, broken peaks. Walk beside streams gurgling, often in wide multiple strands, over pale, calcinated beds, cateracts and waterfalls of frozen stone, passing still little lakes that range from emerald to the palest turquoise. 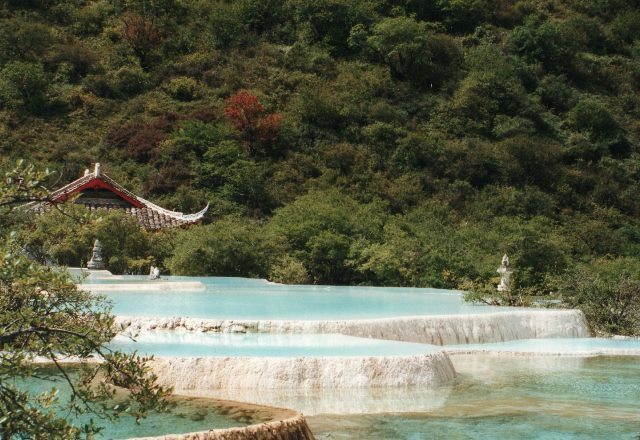 A day's drive away is Huanglongsi, an ancient Buddhist temple set amid milky-blue calcium-walled pools, high up a valley of streams rushing down calcinated beds and little waterfalls. Increasing crowds ruin the atmosphere at certain times of day. Pick your time carefully. Note: Negs: popularity - crowding at some times of day. 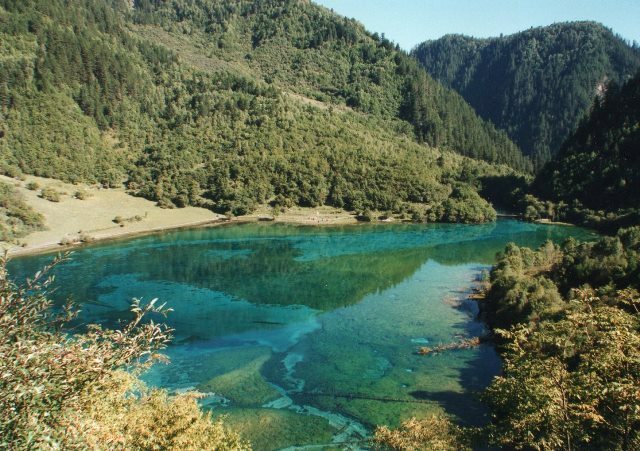 Jiuzhaigou is almost a joke, it is so beautiful, a pair of magical valleys of forests and shimmering mineral lakes nestling among soaring peaks on the crazed eastern fringe of the Tibetan massif in an inaccessible corner of Sichuan province in western China. 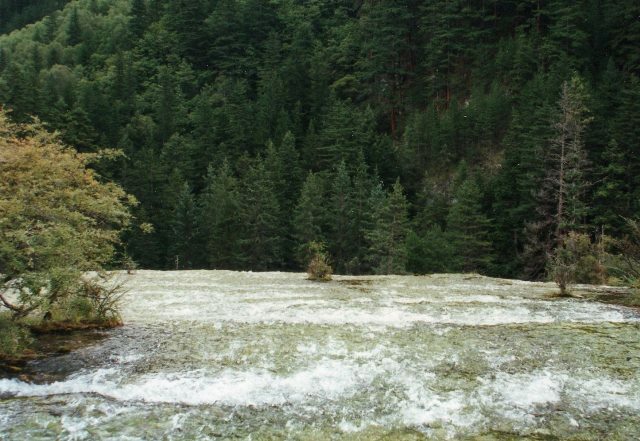 Gorgeous waterfalls and cascades are everywhere; lower down, streams meander through glossy meadows grazed by herds of ponies. 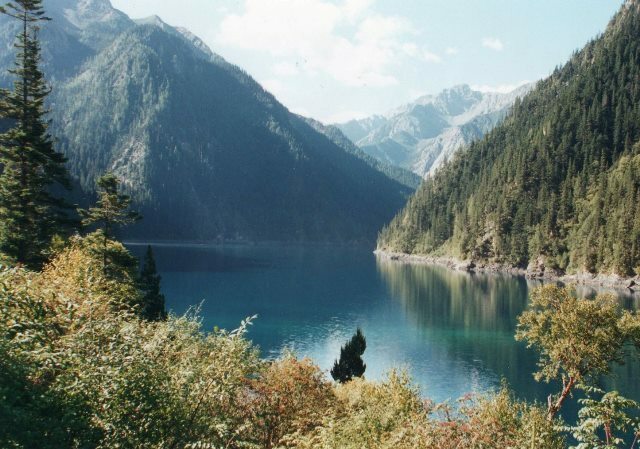 Jiuzhaigou has a famously rich variety of natural life and is the home of rhododendrons, pheasants and the reclusive panda. 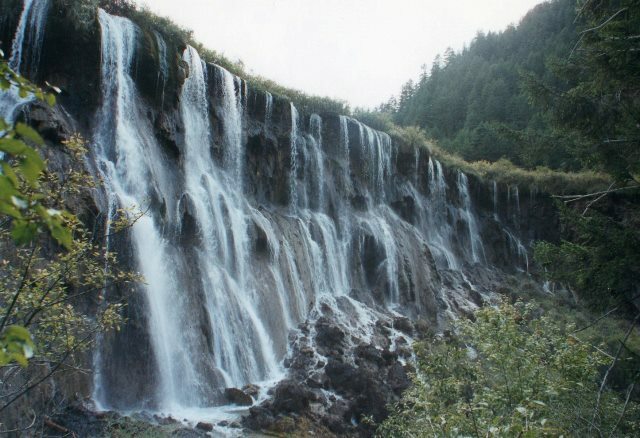 Jiuzhaigou's inaccessibility has been its protection. It is now an official Beauty Spot, World Heritage Site and World Biosphere Reserve, and the risks of ruin by crowds from the plains are huge. Its Biosphere designation is particularly valuable, and the authorities seem to be working hard to conserve it, a welcome example of China's belated wakening to its heritage. But, the crowds are increasing. 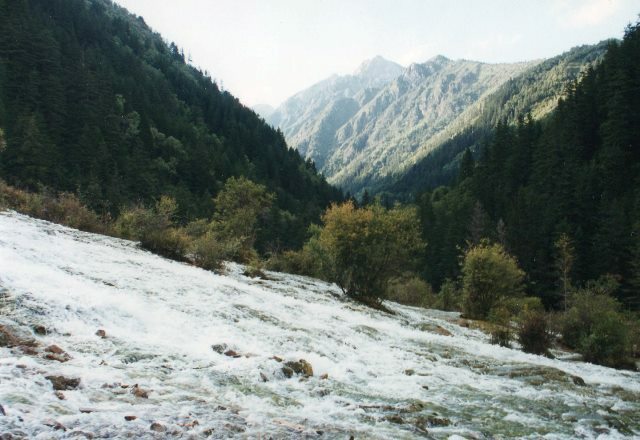 Jiuzhaigou is over 30 km long and divides half way into two upper valleys. Something strange and geological has happened - in essence the interaction of earthquake, ice and water with the karst limestone rocks. 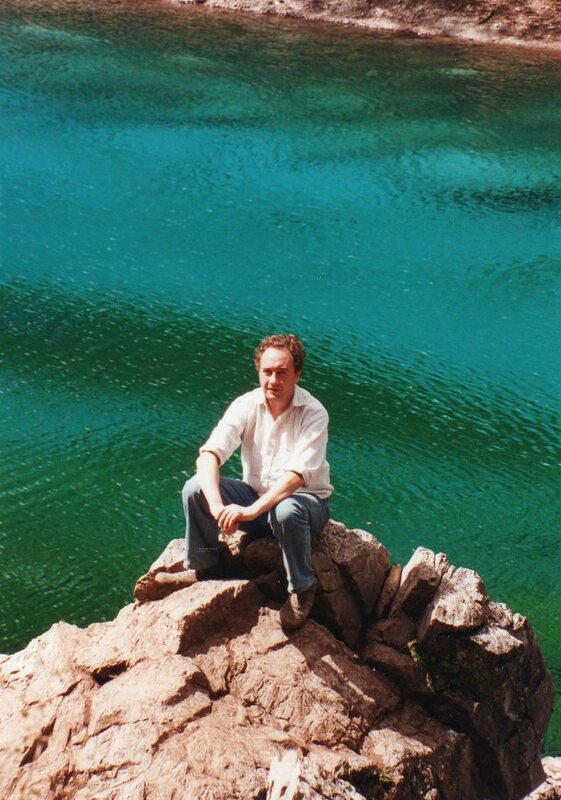 This has resulted in pools and lakes of wondrous colours - from the lightest turquoise to the richest emeralds, blues, even purples - retained by pallid calcium based dykes. Waterfalls and cascades rush between the lakes over yellow chemical pavings, often punctuated by bushy islets and smaller pools on the way. The water and air are so pure that all colours are a little unreal in their intensity, a feeling increased by the bright autumnal trees when we where there, which created some psychedelic colour contrasts. Although parts were logged until 1979, much of it remains beautiful, virgin forest, a lot of it deciduous, protecting small populations of giant panda and golden snub-nosed monkeys, none of which you are likely to see. At one valley-end is a silent primeval forest of vast, mossy proto-pines, sharply sunny glades and dank corners. At the top of the other is an exquisite lake which disappears away beneath peaks showing early snow under the clearest of skies. It is the Alps without the domesticity. The most famous sites were, when we were there, briefly crowded twice a day as the buses come and go, when Tibetans do brisk trade in yak-perching fancy dress photo-ops. 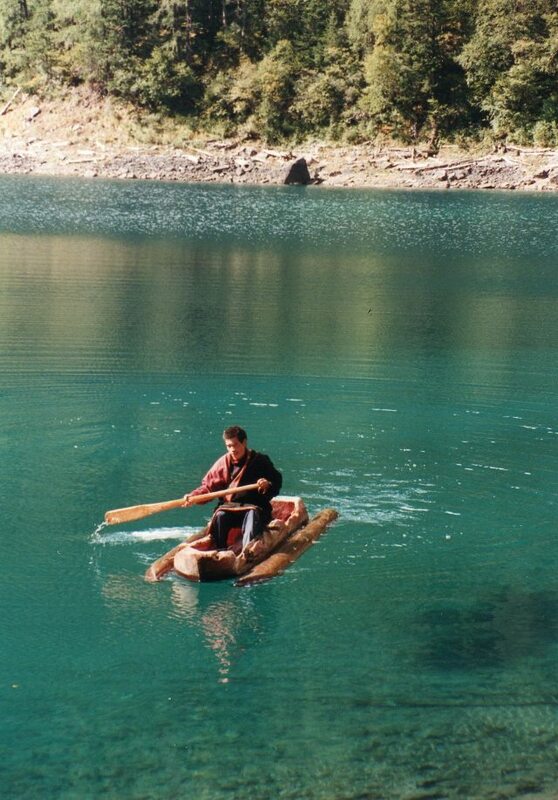 Then the yodels and hoots fade and you can walk down through the silent forested valleys beside the streams and lakes. 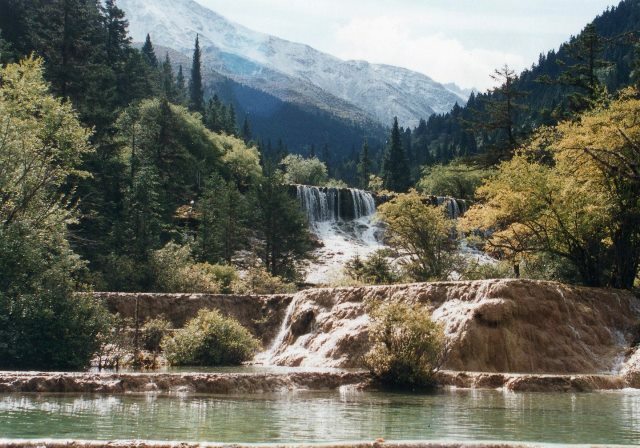 There are some fairly basic hamlets, from which Jiuzhaigou ("Nine Stockade Valley") took its name, with tattered prayer flags and occasional prayer wheels, some of them water driven and delightful for it. 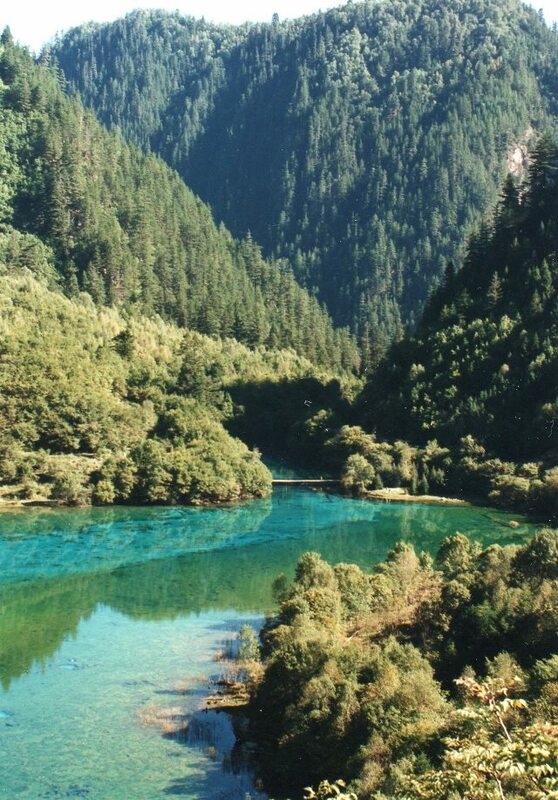 From Jiuzhaigou you can get to Huanglongsi (Yellow Dragon Temple), in a day. 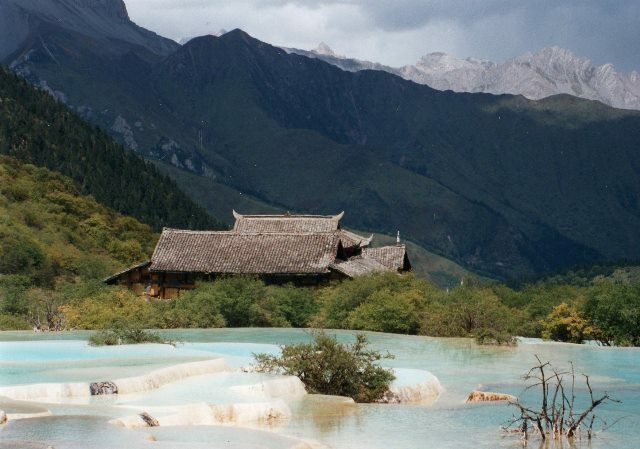 This World Heritage Site is another weird valley of pools, falls and wide streams rushing over pale beds, where you can climb, breathlessly, to an ancient Tibetan Buddhist temple at some 12,000 feet. It is a gorgeous place with the palest blue pools behind white calcium retaining walls and deciduous forests, just turning to autumnal golds and russets when we were there. Massive peaks glowered overhead. In spring it is a blaze of rhododendrons. You can stay in hotels outside the pack entrance, or in primitive guesthouses up the valley. Access is getting easier, which does not help atmosphere at some times of day, although it still takes getting on for two days to drive there.